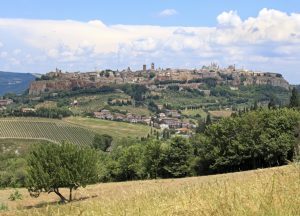 The famous rock of Orvieto is just the basis of a city where everything is about art and history. Ages come across the town starting from the Etruscan civilization, through the Middle Age, until today. Since then, time has not been able to damage the wild beauty of the red volcanic rock plateau (which Orvieto is made of) but it testifies about its supreme art and beauty. Putting together the famous Duomo, Saint Patrick’s Well, Moro Clock Tower and many other artistic treasures, you easily get a unique glance over the Orvieto masterpiece. Another perspective of Orvieto is its underground life, tunnels, caves and wells are visitable at several sites such as the Orvieto Underground, the Labirinto di Adriano, the Pozzo della Cava and the S.Andrea church basements. The Orvieto surroundings boast other attractions and nice place to visit, in just few minutes you can reach from the city, the villages of Civita di Bagnoregio and Torre Alfina in the north of Lazio, while, at the same distance you can find the wonderful Bolsena Lake. Going north, you will find the enchanting Tuscan lowlands and the famous Val d’Orcia with great towns and villages like: San Casciano dei Bagni, Pienza, Montepulciano and Bagno Vignoni. Distances > Rome (110 km – 68 miles), Florence (149 km – 92 miles), Perugia (66 km – 41 miles), Terni (75 km – 46,5 miles), Siena (120 km – 74 miles) Assisi (70 km – 43 miles), Todi (30 km – 18,6 miles), Bolsena (20 km – 12 miles), Viterbo (45 km – 27,9 miles).